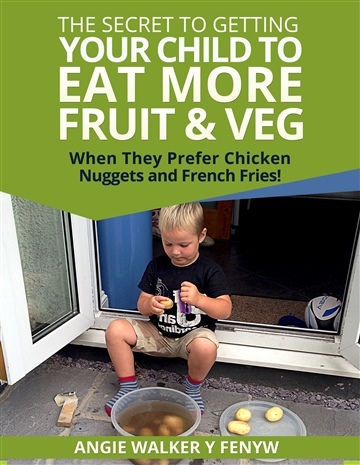 The Secret To Getting Your Children To Eat More Fruit & Veg When They Prefer Chicken Nuggets and Fries! A cute little booklet, Loveuloveyourchild, especially when they may only want to eat chicken nuggets and French fries and you are not supposed to force kids to ‘clean their plate’ or make meals a power struggle. This short report is aimed at preventing food fads from a young age, it makes life so much easier! It can help to start early, offering your toddler lots of different types of foods and letting them see you eat and enjoy a variety of foods as you all sit at the table as a family, especially fruit and vegetables. Although infants often get a lot of fruit and vegetable baby foods, once they start eating table food, what you eat is going to be a big influence on what your children like to eat. If you rarely serve vegetables with meals or eat fruit, don’t be surprised if your children develop the same tastes. What if you haven’t taught your toddler to eat a variety of fruit and veg, is it too late? No. It's not too late to get your older children to eat more fruit and veg, but rather that they won’t do it on their own and that you are going to have to work at it. This small booklet is aimed and helping you do just that. Angie ran her own successful diet/nutrition and fitness club, teaching nutrition and fitness in the UK for ten years until she sold it. Angie then changed career and became a teacher of nutrition, IT, literacy and numeracy to the wider community through her work for the charity SCOPE. As a direct result of the growing problem of obesity and lack of healthy eating in the western world, LoveUloveyourbody was founded as a company that promotes health and wellness through top nutritional supplements, bringing years of experience and common sense to healthy eating and nutrition. Angie felt that e-books are a fabulous vehicle for helping others access good nutrition advice, quickly and economically. Photographs of Angie’s grandchildren in her books are courtesy of her daughter Zoe Francis. Angie is married to the lovely Jules and has two children, Dale and Zoe and four grandchildren, Gethyn, Josephine, Isla and Kelly.